SEOUL, Oct. 18 (Yonhap) — South Korea’s government said Thursday that the country’s Chollian-2A, a geostationary weather satellite, will be launched on Dec. 5. 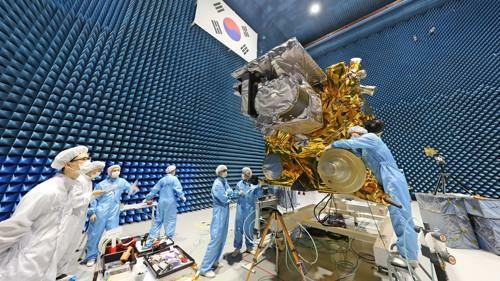 The multipurpose satellite, developed by the Korea Aerospace Research Institute (KARI), is set to lift off aboard a rocket made by Arianespace from the Guiana Space Center at Kourou in French Guiana at 5:40 a.m., according to the Ministry of Science and ICT. The Chollian-2A is a follow-up satellite to Chollian-1, the country’s first geostationary satellite launched in June 2010. While the first Chollian was designed for oceanography and meteorological observation and may fall short in terms of quality of images it sends back, compared with newer satellites, the Chollian-2A can provide images with much higher resolution and a faster download speed.